A Window Sill is a strip of stone with 1 long side finished edge. Straight polished/honed edge side has top and bottom 1/8" bevel to match the finish of its top surface. All natural stones are products of nature. The picture seen is for representation only. Natural Color and shades will vary from one piece to another. No two pieces of products will be alike. 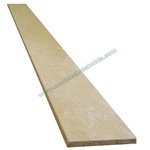 A Window Sill is a strip of stone with 1 long side finished edge. Straight polished/honed edge side has top and bottom 1/8" bevel to match the finish of its top surface. 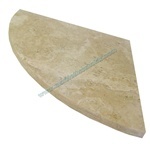 All natural stones are products of nature. The picture seen is for representation only. Natural Color and shades will vary from one piece to another. No two pieces of products will be alike. 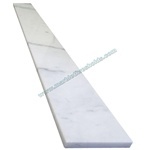 White Gray Polished Marble Threshold 6"x36"x5/8" - Double Hollywood Bevel Travertine Corner Soap Shelf Shower Caddy 9"
Double Hollywood Bevel is a 1-3/8" Bevel on 2 long sides of the threshold. Threshold is 5/8" thick on top level and chamfers down to 3/8" thickness on edge. Bevels and the top surface of the thresholds are polished. All natural stones are products of nature. The picture seen is for representation only. Natural Color and shades will vary from one piece to another. No two pieces of products will be alike. Walnut Honed Travertine Shampoo Shelf - Corner Caddy. 9" Radius, 3/4" Thick with 1/8" bevel eased edges. Top, circle side and Bottom surfaces finished.